Impressive shine. 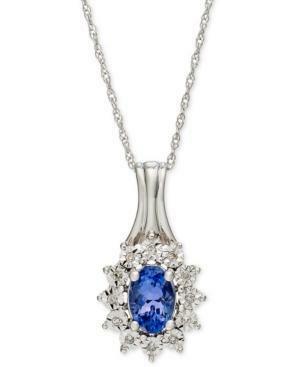 Command attention in this statement-making necklace, which features an oval-cut tanzanite (1/2 ct. t.w.) centerpiece encircled with sparkling diamond accents. Crafted from 10k white gold. Approximate length: 18 inches. Approximate drop: 3/4 inch.